← So you have a Thermomix… now what? Breastfeeding Mums and Refluxy, colicky babies… can diet changes help me? This is a loaded question depending on who you ask! Many paediatricians and GPs will tell you that nothing you eat goes through breastmilk. All food in moderation. I’d like to challenge this. Infact I say this statement is rubbish. Irrespective of those who become aware food intolerances in their kids, like I myself… how many breastfeeding Mums have noticed that if they eat ‘gassy veggies’ like broccoli, cauliflower, onion or garlic, that they end up with an unsettled baby? What about alcohol? If nothing goes through into breastmilk, why is it recognised that alcohol goes through? Food molecules are not necessarily larger than alcohol, so surely its logical that some things may go through. Have you ever heard of a mother taking probiotics to help their baby’s digestive system? How is that possible? Small and large intestine cross section. Full credit to Vetmed for this graphic. The theory is that our digestive system starts at our mouth when we chew, and it continues the whole way until it… exits. In an ideal world, it is a separate entity from our blood. Food doesn’t cross into our blood stream thanks to those villi and multiple layers of intestines. So we are lead to believe anyway as 1st, 2nd, 3rd and beyond year Science Students! I personally think that bread shouldn’t be able to sit on a shelf for a few weeks without growing… nor should many things we eat survive in the pantry as long as they do! What about the preservatives in soft drinks? Isn’t there enough sugar? No, they add it to almost every fizzy drink out there… needed or not. Another thing which is more commonly used now than (say) 100 years ago… antibiotics, and the massive variety in types and composition. Now don’t get me wrong, these save lives and help us to lead the busy and diverse lives we do without being brought down by the common infections which were once so much more dangerous. However, the ingredients within these medications are well beyond just the antibiotics… have you see how brightly coloured and flavoured most kids antibiotics are? Probiotics are encouraged by some physicians, but they don’t emphasise how these may need to be taken for MONTHS to reverse the damage to the gut flora. 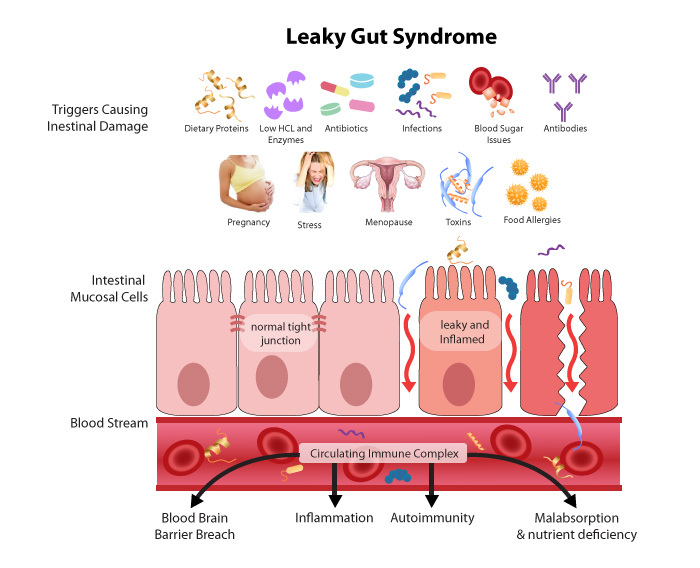 Gradually gaining recognition in medical fields is the concept of a ‘leaky gut’. Many medicos only recognise it in a very small group of patients, but, I believe there is plenty of evidence that something is going on! Those using elimination diets identifying food triggers are inadvertently supporting the concept… eat food, some of the food proteins or other molecules go through the digestive wall, which would normally prevent the entry, and the body reacts to these extra molecules being in the blood stream with migraines, behavioural issues, eczema, asthma, etc. As you can see, there are way more triggers listed in the image for intestinal damage (anyone pick the typo too? hehe)… including pregnancy. I have heard so many times when pregnant that our body absorbs more of our food when pregnant. Maybe this is what they meant?! Pregnancy puts our entire body under a lot of physical stress, far beyond the cankles and tiredness that many will think of. So, lets think about it… we eat food, especially mothers of newborns (or newborns + other kids), in a tired daze we grab whatever food is easy and quick to consume… do we think about whether this will go through into our blood stream? Hardly. We eat the bread that can quickly be smothered in… margarine (err almost all of which have preservatives in)… and then we put vegemite or any number of other spreads on it which may be high in preservatives, additives, things to make it stay emulsified etc… or we have a quick sugary hit which may keep us awake in our never ending weary state, but is probably full of more colours and additives. SO many of us eat wheat and dairy-based products thinking they are just what we need to keep our energy up, but in a leaky-gut state, wheat and dairy are often the hardest things for our body to break down (gluten and casein – the proteins of these foods)… so they enter the blood stream… along with other proteins and food chemicals which shouldn’t go there. In sensitive babies, with ‘open’ guts (not yet fully mature, designed to absorb the nutrients from breastmilk), they can’t process these extras that they are inadvertently getting. It takes more metabolic energy to digest, and this puts a strain on minerals such as magnesium, zinc and calcium as the body tries to flush them out. Let alone the immediate response to these foods can be of physical irritation – severe reflux, colic, inability to sleep, not wanting to be put down, slow weight gain, large weight gain (from wanting to drink constantly to soothe the pain). I can’t tell you how many times I’ve been told that a mother’s milk is ‘bad’ and that she should give up breastfeeding because there isn’t enough there for the baby… meanwhile the baby was probably just reacting to something she was eating and trying to ‘self soothe’ by drinking more. Let’s not even talk of others. *I* have been told so many times I should give up breastfeeding and put my children on formula. It would be better for me (! ), better for them… why? So that I can have the convenience of eating more variety? So that I can risk them reacting to the formula and then having my supply dropping off and being unable to regain it easily? Luckily by #3 I learned to just ignore the comments. I’m starting to realise in my reading and talking with parents that there are a lot more babies out there who would benefit from parental awareness on this concept of an open gut. Just because you can’t see a rash, your baby is ‘just a bit colicky’ or even ‘one of those’ who are chronic nappers and who never really settled well into long sleep patterns… doesn’t mean your child has any less ‘open’ of a gut than the next child… and their tummy may be far better off taking things slower with solids or with what you are eating (if breastfed) than you realise. As more and more families get settled, sleeping children when they review diet and find the underlying cause of food intolerance…. maybe this will become more recognised? How many times have you heard “…my child didn’t sleep through until 3…” but then they continue to explain how the child has always been a strong-willed child who didn’t want to go to sleep, to eat what was given to them, etc? Many of these characteristics are common to those reacting to natural chemicals in the foods (amines, salicylates, glutamates and even gluten/dairy)… so the symptoms just change over time as the child matures. You don’t pick to have one of these kids. You don’t aim to be one of ‘THOSE’ Mums with kids with food intolerances (or worse, allergies)… but you may already have one and not recognise it yet… you may have a few who do and not realise it. All of ours have, and we NEVER considered ourselves one of ‘those’ families! I digress from the topic… breastfeeding Mums. So, if you are breastfeeding, and you have an unsettled baby, what on earth can you do to determine what the trigger/s are, before you start looking into a full Elimination Diet? Get rid of anything with ‘numbers’ – especially preservatives, colours and flavours. Flavours are often just listed as that… they are proprietary and may be safe, but honestly, best excluded and you can challenge them later. ….this includes looking at margarine’s (try preservative free butter? ), spreads, dips, sweet and savoury biscuits. Minimise tomatoes, citrus, onion-family (some of the onion-family veggies are ok in the RPAH elimination diet but seem to still stir up little bellies), berries (sorry! ), and be mindful of what fruit/veg you select. Aim for pears, ‘just’ ripe bananas, red or golden delicious apples. EVERY ‘standard’ commercial softdrink (coca cola, schweppes etc) in Australia has a preservative in it EXCEPT Schweppes Lemonade in a bottle. Not in a can. In a bottle. Preservatives alone can be a massive trigger of unsettled behaviour in babies, not the sugar or anything else you find in the softdrink. Try to get butcher-fresh meat, especially chicken and lamb. These are lower chemical options than pork or beef. Sound impossible? Its not, trust me… it just takes a *little* planning. Soon I’ll post about some quick ideas to help overtired and time poor Mum’s know what is ok to cook here… but for now, think quick pan-fried chicken, steam some carrot, potato, swede, choko and zucchini, or grate and mix into chicken mince, or any other combination therein… and viola, you have a meal. If you want help with where to start, please contact me to arrange a consult.